Hawaiian Beach Boys style surfing comes to our shores. Local and international tandem surfers will perform on 3 separate Northern Beaches locations this summer to showcase the bewildering art of tandem surfing. This surfing style which comes from Hawaii consists of a male and female team of surfers riding together on one board, performing graceful and acrobatic lifts. Couples have to perfect their routines on land before attempting them on the waves. Both land and water performances are equally entertaining and are sure to astonish beach goers on these 3 dates. For those interested in giving tandem surfing a go, the tandem teams will stick around all day to give out advice and encouragement. 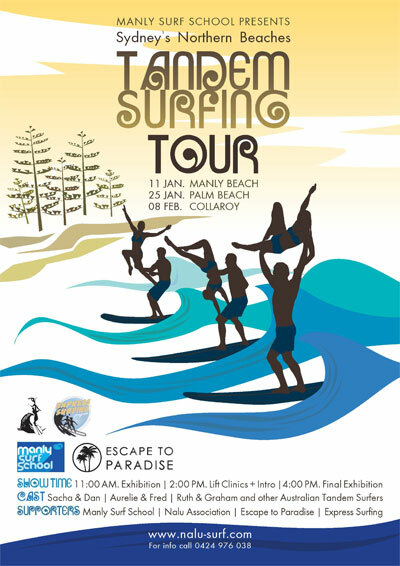 These shows are brought to you by Manly Surf School which now offers Beach Boys style surfing lessons including tandem and stand up paddle surfing.